The most visited Antoni Gaudi work in the whole of Barcelona is Sagrada Familia. Somehow my luck was weird! Wherever I go, some renovation work was happening, be it Windsor Castle, Florence Duomo, Pisa Cathedral, Casa Vicens, and here too! It is frustrating to be there but not see the exquisiteness of the place in its true glory, but only with cranes protruding from here & there or digitally printed flex of the original hung in front!!!! Well, coming back to Sagrada Familia, its a huge Basilica, was built over a long period from 1883-1933, first under architect Francisco de Paula del Villar y Lozano, then later under Antoni Gaudi. This is Gaudi's masterpiece and when he worked on this, he worked exclusively on this. Being a devout Christian, he dedicated himself completely to this, so much that when he died, his mortal remains were buried here. Unfortunately he didn't even see it get completed. There are 2 facades to the Church. The entry is through the Nativity Facade and the exit is through the Passion Facade. When I saw the Koekelberg Cathedral, that was the weirdest looking church that I had seen, but now, after looking at this, this ranks no. 1!!! The sculptural intricacy was so much like Indian temple sculptures with so so so much detailing!!! Unlike other Gaudi architecture which were just fluid shapes, this was a crazy mix of geometric shapes and fluid shapes. Perhaps because the prev architect Francisco designed a Gothic architecture which Gaudi converted as a Nouveau! As you enter through the Nativity Facade it takes immense time to look into the sculptural detailing. It tells the whole story, right from the appearance of Gabriel to Virgin Mary, crowning of Virgin Mary, His birth, huge comet right atop Him, older shepherds holding him in the hand, younger shepherds seeing Him with awe, kids totally rejoiced with all smiles, the 3 wise men, celestial beings singing & playing musical instruments, turkeys & hens roaming about, escape to Egypt, Jesus as a toddler with Joseph, Jesus as a young carpenter - every tiny detail that you could think of, is there in stone, sculpted!!! Words are written in several places to denote who is who, incl Jesus!!! Guess what this is? Its the portal at the entrance. While most churches has celestial beings here, here's Gaudi's master mind and quirky self! Are they bats, leaves, shells?!!! The doorway is split into 2 with a huge tree in between. Both the doors are filled with leaves and insects incl spiders, geckos, flies, butterflies, moths, ladybirds, grasshoppers etc. So when the doors are closed, the whole effect would look like one huge tree or rather a complete ecosystem! There's also a separate tree filled with doves! While the entire sculptural detailing was fluid, the interiors was completely geometric. The pillars opens up to the ceiling like the branches of a tree, but just completely geometrical. The ceiling patterns are also completely geometrical. The stained glass windows are again very unique. There aren't much of detailed painting, but are geometric but asymmetric glasses. The are 12 windows on either side, each window bringing in a color from green to violet on one side and from red to yellow on the other side. This is the structure on either sides of the altar which leads to the tower. I don't know if its accessible for the public, but since restoration was happening when I went, it wasn't allowed. Even the ceiling of the crypt has a similar geometric feel to it. The exit facade is where the Passion panel is. This isn't as detailed as the Nativity panel and its much less complicated and minimalist. The scenes here incl, His prayer, Him carrying the cross, and being crucified. Again from outside, this is a spectre to see the 18 impeccable, gigantic, colorful towers - 1 representing Jesus, 1 representing Mary, 4 for the 4 gospels and 12 for the 12 apostles. All of these are covered with Gaudi's typical multicolored mosaic pieces! And don't miss the frail Jesus Christ ascending to Heaven between the 2 towers on either sides (1st pic of this post), in this facade. Here's a tip: Buy the ticket online. There is no point standing in the queue there. When you buy online you choose a time slot and you have to get to the Nativity Facade at that time. If you're buying the ticket there, if its crowded, you might get the slot a couple hours later and that's exactly what happened with me. I ended up visiting every place twice, once to get the ticket and once to actually see the place!!!! P.S: I was invited by Barcelona Turisme - Barcelona Card to experience the city for review purpose, however the opinions are my own and this post does not to advertise the product/service. I found it difficult to get a great angle for a shot of the Sagrada Familia, it would be a great idea for someone to open a rooftop bar opposite wouldn't it! I didn't realize the detail in the building!!! Jesus and Joseph and so many stories! On any future trip to Barcelona I'll be back here checking out the detail, hopefully I'll find a great viewpoint too! When we visited Spain we could not see the entire country so we started in Madrid and went south so we could take in Gibraltar and have a day in Morocco, too. SOO want to see Barcelona and Guadi's work. Looks stunning! I'm wondering about the bats or the leaves...and what the kids would have to say. It is always so interesting to get their perspective. It is a true testament to Gaudi’s genius - no matter how many people write about Sagrada Familia it is still entertaining to read. Thank you for providing such mundane details as ticket prices and a link to the website to buy tickets. These small details really save lots of time. Happy travels! You really captured the gothic look of the Sagrada Familia, I bet it was an experience to go inside as well? Thank you for the details and the link to the main site, this is on my list of places to visit, when I head to Barcelona. The Sagrada Familia has such a unique design. It's instantly recognisable. I can understand your frustration about renovation work though. Although it needs to be done, it frustrates me too because I can't take good photos and I don't know if I'm ever going back there again. Beautiful photos of the details on those stone sculptures. So many lovely details, and I am still not sure if those are bats. I seem to have your luck, everything is constantly under scaffolding. The first time I saw a picture of Sagrada Familia, I thought it was ugly. But after seeing it upfront in Barcelona, and actually studying the details of its architecture, I'm fascinated by the creativity of Gaudi. A monument worth seeing. The Sagrada Familia has always fascinated me. I have seen it numerous times but have never gotten up as close as your photos. It's so interesting to see the detailed scenes and to imagine the work that must have gone into them. You've made me want to go back again! I visited Barcelona last year and I was lucky enough to visit Sagrada Familia. Similar to my recent travel, the commercial establishment of the place where I've been is halfway done (under construction). I'm very familiar with his name. As far as I can remember, Antoni Gaudi was tackled in our Cultural study back in my College days. You're lucky, you've experienced the place and saw his architectural art with your very own eyes. The Sagrada Familia is one of my favourite places in the world and I just find the building incredible. I've heard it is going to be finally finished this year which would be amazing. I love photographs and architecture, there are a lot of angle you can capture. I hope I could visit Sagrada Familia. Thank you for bringing back wonderful memories. I have also been to Sagrada Familia it is on my must see while I was in Spain. Great Photos. Really blown away by the architecture, the sculptures are well detailed. That is a nice piece of history for the day. Totally worth reading. I have been a couple of times in Barcelona but never made it into this fascinating building, since the queues were for me waaaay to long... But I see it is even more impressive to be inside. Great inspiration, next time I am in Barcelona I will take the time to check out! Wow, I love the sagrada falilia and Gaudi's work... especially if you think of how long this site is under construction. It's a very impressive building. My friend just came from Spain and I can see their photo at Sagrada. It's a really unique structure and also really beautiful. This is the first article I've seen on the Sagrada Familia that emphasizes how intricate the carvings and sculptures are (and provides tons of photos). Everyone else stresses the design and overall architecture but it's neat to see the little details, to know that the place wasn't just a grand vision. Too bad Gaudi died before seeing his masterpiece completed, but i guess a good piece of art is never truly completed in the eyes of the creator. I love Sagrada Familia because it's different from all that you get to see. Thanks for reminding me about my trip there :). The detail on this is really incredible, youve captured it so well. Im hoping to visit later in the year and this has got me really looking forward to it! Spain has such beautiful architectures and churches. The Philippines also has beautiful churches most likely because of the Spain`s occupation in the Philippines. Your photos are beautiful! I loved visiting the Sagrada Familia when I was in Barcelona. It's very interesting to read about more details, like the birds and creatures at the entrance and the labels for the Biblical figures on the walls. I think it makes sense that the Passion side would not be as elaborate as the Nativity side too. 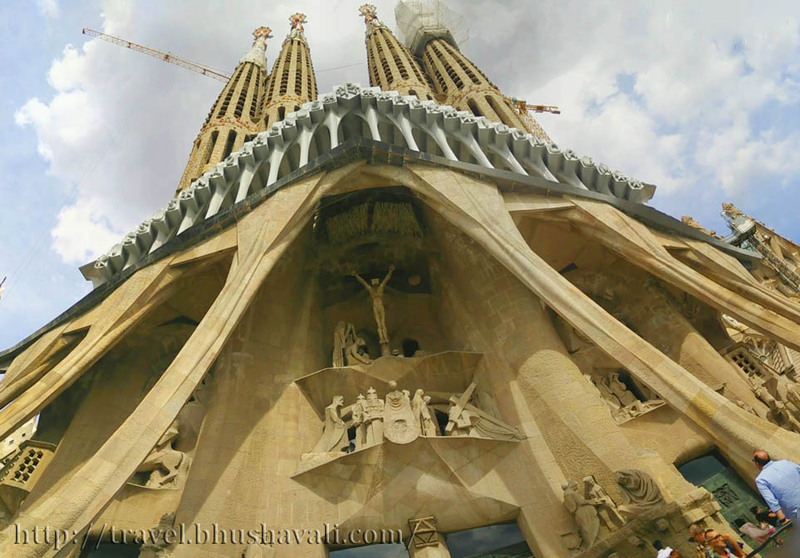 Such beautiful photos of the Sagrada Familia! I remember visiting years ago but I loved reading about your details in depth! It must be so hard to fit the entire building in your frame! You need an ultra wide lens in order to do that. It must be enormous as I can say from your pics. I like the facts that you give about the cathedral and having many photos! I have heard a lot but unfortunately haven't been able to make a visit yet. I like the details that are presented in this post. So much detail! I cannot imagine the work that went into this art! Too bad he did not live to see the completion. The geometric designs are quite extraordinary, but the stories told through the art seem mesmerizing. I could spend hours there. Too bad there was construction when you went! i have sent so many people here when i make a itinerary to Barcelona for my clients and i really like this place so offer to every client. But never seen so much beautiful photos. Here all these photos making me love more this place. Just stunning! I'd love to visit and just admire the architecture. I really appreciate these places, especially when they are kept very well taken care of for generations to come. This is so interesting! the mixture of the two architects styles! Would be very cool to see. I last visited the sagrada familiar about 8 or 9 years ago and there was still a lot of scaffolding up. It looks so much more finished than last time I was there. I will be visiting Barcelona again in June so I will have to visit again and see the difference. Such beautiful architecture. 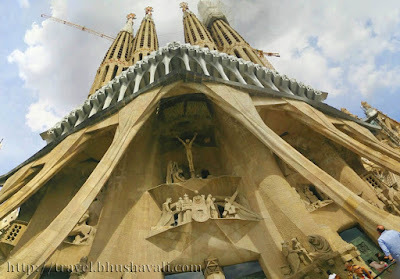 Beautiful pictures of Sagrada Familia and it is a gem of Spain. I can say same pinch to you because wherever I also go, renovation works starts and some points are blocked for entry. The intricacy in the works of exterior part of this cathederal is photogenic. Even the stained glass windows too. At the portal entrance carvings, I can figure some lizards also.